(Since I wrote this article originally years ago, I have purchased a new chair that I write about in this article). Within the past couple of weeks I gave myself a Christmas present. It was a brand new home office chair. Ya know what? I wish I splurged on this office chair a whole lot sooner. I cannot imagine a better chair for my needs. I picked it up at a local office superstore, Staples to be precise, and it fits my needs perfectly. The one I purchased is called a Strobelle Chair and instead of assembling it myself, I paid the additional $7 they charged to have them put it together. I could've done it myself but, hey, it was a Christmas present! I went into this purchase with a number of prerequisites in mind and this office chair met them all. 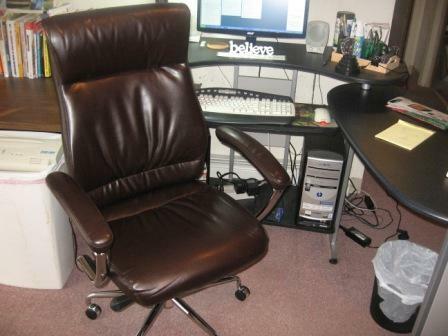 The one that I bought ended up being a leather office chair but that wasn’t one of my prerequisites but, after using it for a while, I love the feel of leather. Here are my five keys to finding the best office chair for my needs. Maybe they will match what you are also looking for in an office chair, at home or in the office at work. Do you know that there are people who pay over $1000 for an office chair. I guess if you have the money and put a high priority on comfort and support, you should probably go out and buy the best office chair for you, even if it has an exorbitant price tag. But, if you are like me, you don’t have a lot of excess cash to invest in an office chair. I set a budget of $200 on my home office chair and I was able to find one that fit all of my specifications. I’m a firm believer in value when it comes to any purchased item and I think you can find good value in an office chair if you look hard enough. These days everyone likes to buy products online. There are a lot of people that come to this site to find out about certain cubicle accessories, productivity software, and office products that I use and endorse. But when it comes to the best office chair for you, I think that the only way that you can buy one online is to find one at a bricks and mortars store that you love and then order the same model online. You can read the office chair reviews all you want, but until you actually sit on the chair, no one else can choose one for you. My office chair had to fit me like a glove. I have a hard time recommending others to buy a chair that I bought because maybe for their body, it isn’t a match made in heaven. You have to go and try out a bunch of different office chairs on your own and find out the style and model that you find the most comfortable. If you have historically had back problems you will have to focus on a chair that will support your back properly. Don’t jump into an office chair that is subpar for your body. Wait until you find one that fits like a glove. That’s what I did. I actually have spent the better part of a year trying out different models at different stores. When I came across the one that I loved and it met my budget, I bought it. Not everyone spends a lot of time in their home office. I work from home at least one day a week so I use my home office a lot. 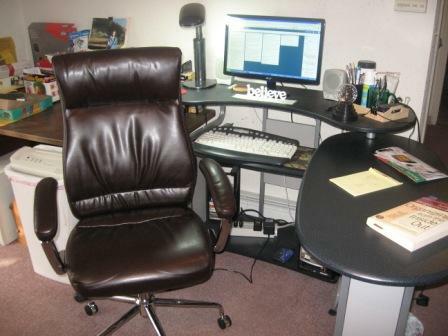 I also work a lot on this website in my home office so I needed an office chair that would have great support in the lumbar area and one that had arms. I think that you should always buy an office chair with arms. Without the arm support, it just doesn’t have the same comfort, at least for me. You can also buy office chairs that have adjustable arms. 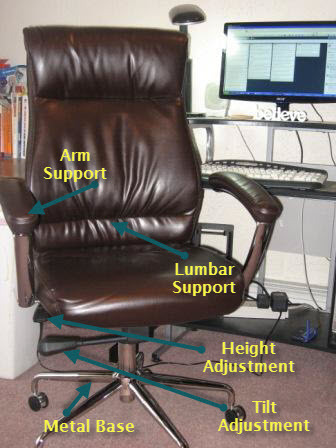 I really didn’t see the need since I am the only one that uses my office chair so if the one I tried out is perfect for me, why pay for the adjustable arms? The lumbar support was a must for me since I have historically had some lower back problems that date all the way back to high school sports. Lumbar support in my car seats and in my office chairs is important to me and to my overall health. I think even if you don’t have any back issues, buying a chair with lumbar support just may prevent any future back issues from cropping up. The office chair that I purchased also has a tilt adjustment which is a slight reclining feature which some people may care about more than I do. This is my home office chair and when I am working at my computer I like my back to be straight up and down so I don’t do a lot of reclining. So, purchasing a reclining office chair wasn’t a big consideration for me even though the chair that I bought does have a tilt feature. For some unknown reason, my upper body is shorter relative to the length of my legs. I’m average height but when I sit at a booth in a restaurant, I oftentimes feel that the table is too high for me. It’s almost like a need a booster seat like my kids used to use! Anyway, when it comes to an office chair, I needed seat height adjustability because, to be honest, I usually have it on the highest setting. I guess if I had found an office chair without height adjustability and it was high enough, it wouldn’t be a consideration. But, just to be sure, I bought one that did go up and down and I also made sure that I sat at a desk while I was at the store just to make sure it had a high enough setting for me. This can be a tough aspect of an office chair to quantify until you have it for a while. But there are a few things you can take into consideration. The base of my new home office chair, where the legs are located, is made out of metal all the way down to the casters upon which the chair rolls (note the feature image at the top of this article). The arm rests are also supported by metal. A lot of the chairs that I tried out had a base of hard plastic and simply didn’t seem to be built the same way as the chairs with the metal infrastructure. I also love the leather which will probably last a long time unless for some reason it gets punctured accidentally. These are my 5 keys for purchasing the best office chair for my needs. My strongest suggestion is to go out and try them at your local superstore or furniture store. Write down some of the models that you like and go back home and see if you can buy it cheaper online. If you have any questions please leave them in the comments. I’d also be interested in what you feel is the most important aspect of your own office chair. Here are my five keys to seeing the best office chair for my demands. Perhaps they will fit what you are also looking for in an office chair, at home or in the office at work. There are five key to finding the best office chair for my needs are valued, must fit like a glove, lumbar support and arm support, and seat height adjustability, durability. Thanks for sharing this valuable article.